February 12, 1809 is the birthday of Abraham Lincoln, the 16th President of the USA. 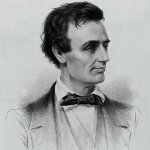 Today February 12 is Lincoln's Birthday, that is a legal holiday in some states. The earliest known observance of Lincoln's Birthday is dated to 1874. A Buffalo, New York, druggist made it his life's mission to honor the president, that is why he repeatedly petitioned Congress in order to establish the day of Abraham Lincoln's birthday as a legal holiday. Only some states recognized Lincoln’s Birthday as a legal holiday. It is celebrated in California, Arizona, Indiana, Missouri, New York, Connecticut, Illinois and New Jersey. Other states combined the celebration of Lincoln's birthday with a celebration of Washington's birthday as a part of another holiday – President's Day. This holiday is observed of the third Monday of February, that is not an actual Lincoln's or Washington's birthday. Lincoln's Birthday is marked by traditional ceremony of wreath-laying at Abraham Lincoln Birthplace National Historic Site in Hodgenville, Kentucky. The same ceremony takes place at the Lincoln Memorial in Washington, D.C.